Yeah, so I just found myself watching this movie today and was so utterly captivated by it, that I was all "what the hell am I supposed to do?" I had to read the novel again. Which I did. Today. And finished it. Today. (My obsessions are brief and occasional but they are obsessions). The 2011 adaptation. The intro to the film confused me a little bit. I know the novel to begin with Jane's childhood with the cruel Mrs. Reed, but here we are looking at an adult Jane (actually, she should only be eighteen but played by 19-year-old Mia Wasikowska) running out of a stone house and into the wild moors. She's crying and there's fake rain all over her. 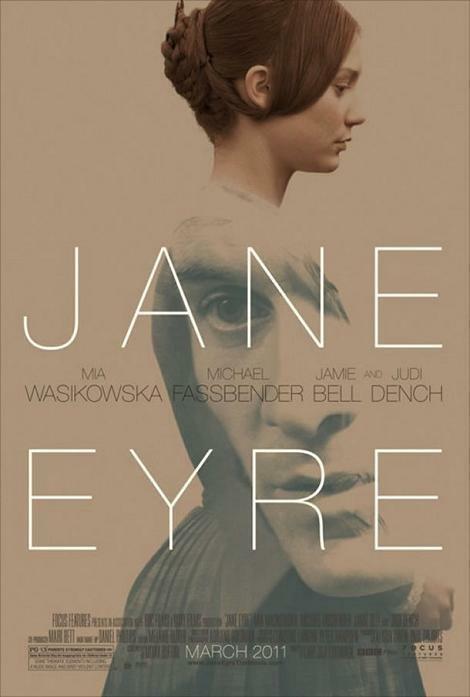 It takes me a while to understand that the film has thrown us right in the middle of the story as Jane runs away from Thornfield Hall after a very ignominious discovery about her master. She's running away to heed her conscience, to preserve her principles and self-respect. She ends up, half-frozen and half-starved at the doorstep of a young clergyman St. John Rivers (Jamie Bell) and his two sisters. There, among these kindly people, Jane recovers and through her recuperation we find ourselves back in time to see her journey up to now. The film is good. I haven't seen any other adaptations of the novel although I am aware of their existence so I cannot compare. Cary Fukunaga's version takes several liberties with the source material but doesn't take from it, instead enhances it. In some parts, the novel was droning and rather austere. For a novel, that's all fine and good, but not for the big screen. The actors inhabited their roles. Until now, I had no idea who Mia Wasikowska was (and I still can't even spell her name right without consulting Wikipedia). She strikes me a little bit as a younger version of Cate Blanchett (my favorite actress in the world) and something a bit of Gwyneth Paltrow in her looks. And I see that she -- holy bovine -- was Alice in Alice in Wonderland! I don't recognize her. Or rather, I don't remember. I was paying much closer attention to Johnny Depp and Helena Bonham Carter, two of my favorite quirky actors, than all the others. But now that I think about it, I didn't really like that Alice very much. The understated performance went past me. Michael Fassbender, I know of course, from X-Men: First Class and also from Inglorious Basterds. He's a handsome actor and I couldn't quite believe at first that this guy who is playing the not-handsome, not-ugly-either, brusque, sardonic Rochester to perfection is him. Such transformation is quite a feat. Michael Fassbender. I gotta remember that name. His chemistry with Wasikowska is great to see: the age difference is obvious but also obvious is the connection. Although the romance between Jane and Rochester felt somewhat rushed because of deletion of certain key scenes, I loved the two actors' scenes together, nearly teared up in that penultimate scene, and was thoroughly touched by the last one. All in all, great movie. Highly recommended. A MUST-SEE. The source material. I've read an abridged version of Charlotte Bronte's novel when I was in high school. I think it was one of those condensed works that Reader's Digest used to publish. I think it belonged to my aunt. I found it among a pile of magazines and what-nots and picked it up quite randomly. I know what you're thinking. Did I read it out of necessity? To do a home reading report, perhaps? Because my high school, though science and math-oriented, was also infamous for their home reading reports. To quell your questing mind: no. Granted, I can't quite remember why I read it -- the title isn't that eye-catching and I have little taste for biographies so -- but it had nothing to do with a home reading report. I did not have to read the thing because of some school assignment. No, I read it of my accord. I remember spending a few days on the book. Despite its abridged version, it was still quite lengthy...and because of the style, I found myself skipping several pages to escape the dreary descriptions. I don't think in pictures, I think in words, so things like descriptions meant to create imagery go past me. I'd sooner read dialogues. However, for the most part, I liked the book, liked the title character, was suitably afraid and at the same time stimulated by Rochester, and a little chilled by the Gothic elements in the novel. But my mind was not developed enough at the time to appreciate the finer aspects of this seminal work, aspects that I, as I am now, am able to appreciate better: Jane's development, her strength and independence, her strong sense of morality, her frailty, her weaknesses, her passion and love for Rochester. Rochester is an anti-hero, cast from the same mold as Emily Bronte's Heathcliff -- but where one is an unrelenting savage who relishes in savagery, the other is a fallen sinner cowed by remorse. I can't make up my mind which one is better. They're both excellent characters, in any case. 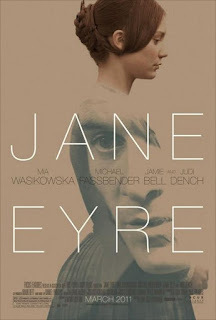 I think Jane Eyre will not replace Wuthering Heights in the top of my list of gothic novels but, thanks to the 2011 film adaptation, it's definitely a story that's close to my heart.